Source: Nature Communications; HO Ham et al. Researchers from Harvard University have developed a biochemical mechanism to extend the time that an implanted medical device can remain functional and not trigger an immune response. In a study published in Nature Communications, the authors engineered an enzyme to make it extremely efficient in replacing the biofilm that coats the devices and prevents unwanted physiological reactions. Medical implants and other foreign elements that contact blood -catheters, valves, vascular grafts- are prone to elicit inflammatory reactions and clots that cause the devices to malfunction. Because of these immunogenic responses, the implants need to be replaced often. To avoid these problems, the most advanced implants are coated with biofilms, thin layers of peptides or drugs that minimize the body’s response to a strange object. Biofilms also avoid device colonization by microorganisms. However, due to phenomena like oxidation and proteolysis, these coatings have a limited stability and activity after being exposed to physiological environments. Moreover, a finite reservoir of molecules further limits the coating’s duration. It has been proposed that biofilms could be re-functionalized with an enzyme that catalyzed reversible bond formation. The Staphylococcus aureus’ enzyme Sortase A (SrtA) can break and form links between peptides, and has been extensively used in protein labelling, purification and immobilization in solid phases, but it presents a very low catalytic activity, requiring huge quantities of enzyme and long incubation times. Professor David Liu evolved a mutant of the Staphylococcus aureus’ enzyme Sortase A in the laboratory. The new enzyme, eSrtA, has a catalytic activity 120-fold over the wild type enzyme. eSrtA was tested for biofilm regeneration in the presence of whole blood, in vitro and in vivo. 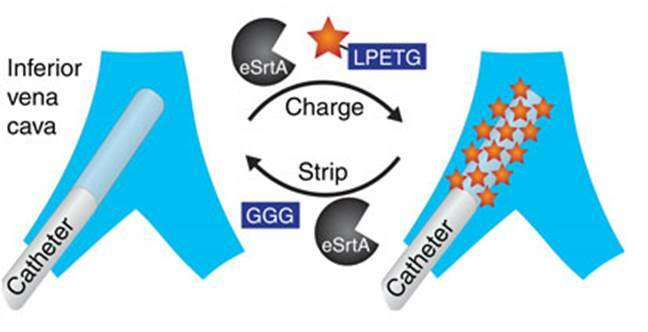 The authors observed that eSrtA performed quick removal and replacement of biofilm molecules, with fast, multiple cycles of peptide bond formation and breakage. The new method could be used to regenerate the molecular components present in biofilms, extending the lifetime of implanted medical devices. Besides, it could inspire new methods of controlled drug loading and release.